Little Anna will be back on our TV and browsers from Monday 12th September. 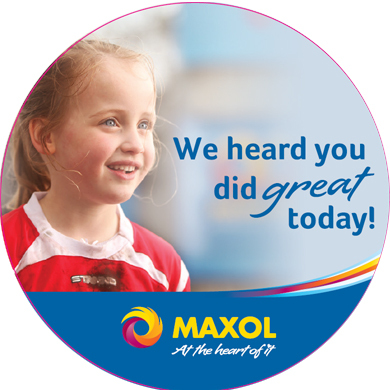 Our campaign highlights the quality and uniqueness of the customer experience at Maxol and our ethos of being ‘at the heart of it’ in the community. The TV ad will run across Ireland and Northern Ireland TV channels and follows the story of a local young girl Anna, who, before entering the Maxol station is feeling downcast having lost a match. Her experience at the Maxol station and its onsite Moreish café and the interactions she has soon turns her mood around and she leaves the station with her spirits lifted. You can view it and a behind the scenes ‘making of’ video below. The advertising campaign is the culmination of the Maxol rebranding project which began in 2012 and has seen Maxol invest €7.5 million to take the brand image to a whole new level. The advert was shot at Maxol Dublin Road, Dundalk. Most of the people featured are actual customers or Maxol staff. See if you spot any familiar faces. The advert will run across RTE1 and 2, TV3, TG4 and UTV Ireland as well as Sky Media channels, C4, C4+1, E4 and More4. In Northern Ireland, it will air on UTV and C4.